In this episode, Richard Comeras (aks “The Crackman”) discusses that foundation crack you’ve known about for years and now suddenly it starts leaking. Listen and enjoy! Narrator: It’s time once again for the “Crack Man Podcast” hosted by A1 Foundation Crack Repair. We’re here with the Crackman himself, Rich Comeras. Rich has 30 years of experience in the construction industry and over 20 years experience as the founder and president of A1 Foundation and Crack Repair Inc. His podcasts provides expert basement water proofing, concrete repair, and preventative maintenance tips for homeowners and businesses. A1 Foundation’s excellent insight will help avert a disastrous flood within the basement, health problems associated with water infiltration within the basement, and protect your biggest investment….your home. The topic for today’s podcast: Why did my Foundation Wall Crack Suddenly Start Leaking After 20 Years? So Rich, concrete will eventually crack at some point, right? It may be fairly normal to have cracks in foundation walls that aren’t leaking and cause no structural concerns, right? Narrator: So why might my foundation wall start leaking after twenty years or so? Crackman: I get this call all the time. In fact just this morning I got a call from Maynard Mass. An older couple have been in their house for 23 years that had a crack in the foundation when they bought it. Now it’s leaking. You got to understand that concrete expands and contracts. Concrete is very strong if you push down on it, but now so much if you push against it. What has happened with this winter that we’ve had is that we’ve had some cold weather, it froze early, ad when soils and water freeze, they push against the foundation. This will make existing cracks bigger. The water gets in there and it freezes and makes the crack bigger a little bit at a time. These cracks allow water to come in. It could also be that we’ve had lots of snow. The snow melting off the roof, you got water coming in. Then comes the rain. Also in winter, I’ve seen this also, the faucet outside the house, people don’t bleed them. They can keep dripping through the winter keeping and causing these situations. These are all reasons why after twenty years, ten years, these foundation walls begin to leak. One thing I’ve always said. There are two types of cracks. One the leaks and one that’s going to leak. We just don’t know when they are going to leak. Narrator: So did that couple make a mistake not getting that crack repaired and waiting for it to finally start leaking? Crackman: A crack lets water in. It definitely lets cold in. And they can let insects in. And usually cracks know when you are away. It can leak when you’re not there and cause problems. Then your looking at mold and mildew. Don’t forget there is moist air in the ground that helps moisture come through that crack. So, get the crack repaired while in your in control of it before it gets control of you. While the Boston area may not be facing a three-day deluge, snow is melting and rain is in the forecast for Friday. So if you find yourself with a wet basement, you’ve got two paths to a solution: Tackle the problem yourself or call a professional. Either way, the first step is identifying the source of your water problem. Is water coming in from the outside, from heavy rain or snow melt? Or, is it an indoor humidity problem? The answer is obvious if you’ve got an inch of water on your basement floor. If not, Family Handyman, a DIY website for homeowners, recommends taping a piece of aluminum foil to your basement wall for a few days. Moisture on the wall behind the foil means water is coming from the outside. Moisture on the front of the foil points to high indoor humidity. Jeff Underwood’s family has been operating Robinsons Hardware in Framingham and Hudson for nearly 60 years. Early on, Underwood’s father taught seminars for homeowners who wanted to tackle their wet basement themselves. The seminars ended years ago, but Underwood still walks customers through their options when they come in, often in a panic. Underwood can rent you a water pump and wet/dry vacuum to remove the water, a blower to dry the area, a dehumidifier to pull remaining moisture from the air, and even an ozone generator to eliminate lingering odors. Places like Home Depot and Rental Depot of Boston also rent some equipment. If you have a finished basement, you need to get the rugs out and replace any sheetrock that has absorbed water. Pull any snow away from your foundation. Make sure your gutters are clean and downspouts are directed away from your foundation. Consider a downspout extender that drains the water even farther away. Once the water is gone, you can plug cracks with caulking and then seal them with a concrete-like sealant, a silicone-based sealant, or waterproofing paint. Those products cost between $30 and $50. This is likely going be a short-term fix: Either the sealant will give way to the water or you’ll get new cracks in your concrete. Your long-term solution is installing a pump and drainage system in your concrete floor. The Internet has plenty of videos that will tell you how to do this, but the tool and equipment list is long and includes a jackhammer. This is when Underwood would suggest calling in a professional. Canelli’s drainage systems run the perimeter of the basement and sit above the surface for easy access, rather than under the floor like some drainage systems. Wall panels direct water coming from outside into a drain channel that is connected to a sump pump. The sump pump removes the water from the basement. It’s not a cheap solution — $6,000 to $9,000 — but it comes with a warranty that transfers to a new owner if you sell your home. Comeras is also not a fan of the hardware store sealants and waterproof paints. “If you think about it, how can paint stop [water] pressure from coming through a wall?” he said. “It can’t.” He explains this — and more — in detail in his Crackman podcasts and videos on his website, www.a1foundationcrackrepair.com. Comeras focuses on sealing cracks and leaks with things that sound very un-DIY — like “epoxy injection” and “weave carbon fiber blanket repairs” — and installing sump pumps. Rather than a drainage system, Comeras’ fixes aim to keep water from seeping in. It’s a cheaper fix — under $700 — that also comes with a warranty that transfers if you sell your home. In this episode, Richard Comeras (aks “The Crackman”) shares his top six reasons why your sump pump fails during a hard freeze. Some will make perfect sense…some may surprise you. Listen and enjoy! It’s time once again for the “Crack Man Podcast” hosted by A1 Foundation Crack Repair. We’re here with the Crackman himself, Rich Comeras. Rich has 30 years of experience in the construction industry and over 20 years experience as the founder and president of A1 Foundation and Crack Repair Inc. His podcasts provides expert basement water proofing, concrete repair, and preventative maintenance tips for homeowners and businesses. A1 Foundation’s excellent insight will help avert a disastrous flood within the basement, health problems associated with water infiltration within the basement, and protect your biggest investment….your home. Narrator: Hey Rich, just out of curiosity, what is the temperature today there in Hudson Mass? Crackman: It’s three degrees…a little chilly out there. Narrator: When the temperatures get that low, I suppose it can effect the proper operation of a home’s sump pump. Yes? Crackman: Absolutely. We’ve been getting calls. One call we got recently about a sump pump not working. The first things I ask people to do is check the outlet that the pump is plugged into and make sure that outlet is working. You need to make sure that you have power to that outlet. During this freeze that we’re having, we’ve got a number of calls about sump pumps not working. So I ask them about the pipes that they use to vacate the water out. People who are using corrugated (usually black) pipe are finding that water within those pipes is freezing. What is happening is that the water is getting into each rib, it freezes, then the water around that next rib freezes, and before you know it that whole ribbed pipe is frozen. So I never recommend you putting a ribbed pipe in there. You want a nice smooth PVC pipe there, and at a good angle. That’s a second reason that pipes freeze. Another reason why pipes freeze is that they have no check valve. The check vale prevents water from going back into the pit. You want to make sure that you have a check valve. Another reason sump pumps fail is because their aged. Mechanical devices will only last so long. We get calls that the float that goes up and down get stuck on the sides of the pit that it’s in. The last reason that people are having problems with sump pumps is because they put a pump in that is oversized, it’s too big, too much horsepower. It causes the pump to cycle too quickly and it is causing them to burn out. So you need to know what size pump to be putting in there. Narrator: This is really good information, Rich. So if your sump pump suddenly isn’t working during a hard freeze, consider the Crackman’s common reasons why sump pumps fail. You just might save yourself some money. If y'ou have any issue with your home’s sump pump or want more information regarding foundation crack repair and basement water proofing, please visit a1foundationcrackrepair.com or call Rich at (866) 929-3171. Or you can email Rich at info@a1foundationcrackrepair.com. In this episode, Richard Comeras (aks “The Crackman”) shares some interesting vignettes on the history of lally columns along with some weird stuff he runs into as he inspects, repairs, and replaces them. My history with lally colums goes way back. My daughter and son-in-law used to work with me in the business. They were at a party in Hudson Mass. Some of their friends were there, also from Hudson, and my daughter heard a conversation involving on of her friends about lally columns. She piped in and said my great-great grandfather invented them and has a patent on them. What are the chances of that happening? It’s about nothing. His mother’s maiden name was “Lally” and that’s how it all came to be. What he had seen was in house fires, the whole house falls right in because they did not have these lally columns to provide more of a permanent structure. He came up with the idea of putting these structures up from the basement floor through the main supporting beam. So the lally column is a supporting column underneath the house that supports the main beams going across the floor to prevent dipping caused by natural settling and caving due to fire disaster. They’re a big issue now with home inspections. You don’t want to have those that are screw-jacked top, or those that are hollow. Today, they must be concrete filled and supported by steel on the exterior. We put a thick steel plate on the top that is welded to the column. In our repair journey, we’ve come across some strange lally column configurations. We were just in Lexington Mass where we were doing a “repointing” job and the gentleman wanted more lally columns because he was putting in new granite and he was rightfully concerned about the weight. So we went down below to inspect the lally columns that were there and some of them you could actually twist. They were great, they had a footing, a concrete pad underneath, but you could turn them. So we looked up and noticed what they had was aluminum flashing between the main beam and the lally column. It wasn’t cut to size properly. We had to fix those by placing a thick plate at the top. We had to dig new footings to support new lally columns for the guy. Clearly the lesson here is you don’t use flashing at the top of lally columns. If you have a basement water problem or if you think you need a professional or want more information on foundation crack repair and basement water proofing, please visit a1foundationcrackrepair.com or call Rich at (866) 929-3171. We've been fixing basement floor cracks for more than two decades, no one knows more than us. There are three things in life you can be sure of: death, taxes, and if you have concrete it is going to crack, you just don't know when or where. With basement floor cracks, oftentimes they crack because concrete is like a piece of raw spaghetti, if you have any movement at all it is going to break. If I ask you to only crack a piece of raw spaghetti part way, it is next to impossible. You have the soil under the concrete that is settling, you may have footings and those settle too, which can cause cracks. Not only do you have settling issues but heavy equipment going down the street or earthquakes (there was one felt in Gardner, MA a few days ago) can also cause cracking. Blasting can cause cracks, or when the concrete is poured it can have too much water, too much wind going on over it, or it can dry too quickly. Oftentimes when they pour concrete floors, by code they are supposed to put a vapor barrier or plastic down. They poke holes in that plastic so the water can penetrate more quickly. This can speed up the time that it takes concrete to cure which can also cause cracking. You may notice in big box stores, some garages, or even in sidewalks that made with concrete that there are lines every so often. These are expansion joints, or basically controlled cracks. These often help concrete from cracking; not a guarantee, but they help. But, in residential construction they don't often put these expansion joints in. Those are some of the reasons that concrete cracks in basement floors. But, while cracks are unsightly and can cause homeowners concern, most often they are not structural issue. But, basement floor cracks do let a lot of cold air and organic odors up, they also let moisture and radon up. Also, if you want to sell your house, buyers get nervous about basement cracks. To repair a crack we have to clean it out and sometimes we have to put a specialty sand or gravel down to where the ground is under the concrete because there can be a 3" gap between the soil and the concrete because that material has compacted over-time. So we bring the sand up to the bottom of the floor and then we put a hybrid 2-part epoxy material or a urethane type material into it which actually welds the concrete together and helps stop the moisture, air, or odors from coming in; and it looks a lot better too. Just recently in Cambridge, MA, there was water coming into the home from around a new water pipe. The water company dug out in front of the house a little bit. Once you dig you disturb the soil which has been getting compacted for what could be around 100 years or for as few as five years. Either way, the rain compacts the soil which helps keep the water from coming into your home. But utility companies put fluffy soil on top of a pipe or conduit and they don't compact it at all. Then in the basement, they will use hydraulic cement, put it around the pipe and call it finished. Hydraulic cement is to be used in an emergency to try to stop water, but it doesn't expand or contract. Soil and stones move because of the freezing cycle in Massachusetts. That's why we have so much water coming in around water pipes, electrical conduits, irrigation cable, and other wall penetrations. We see this all the time. If a utility company is digging down into the yard to install a pipe that is going to run through the wall, and they don't compact the soil, that soil can even act as a sponge and pull the water right to the wall. If the utility company has not done a good job to seal it, that is where the problem lies. To fix this, we'll work from the inside. We will clean out in between the stones and hydraulic cement that they put in. We use oakum, which is like rope. We'll soak that in a polymer resin material and work it into the foundation. That will expand and we then put a specialty mortar over that. These materials will expand and move with the stones and soil, but it will always stop the water. These homeowners had just come home from the closing and thought the water in their basement was coming in from the chimney. They had a plumber come out because the water was right near the furnace and water heater which goes into the chimney. The plumber said everything was okay. So, I further explored with them over the phone on that Friday night. I asked if the water was coming in from where the floor and wall meet. They tried vacuuming it up, and it was not coming in from that area. By process of elimination I asked them if there was a "shoe box looking thing" near the furnace. They said there is. That is a condensate pump. 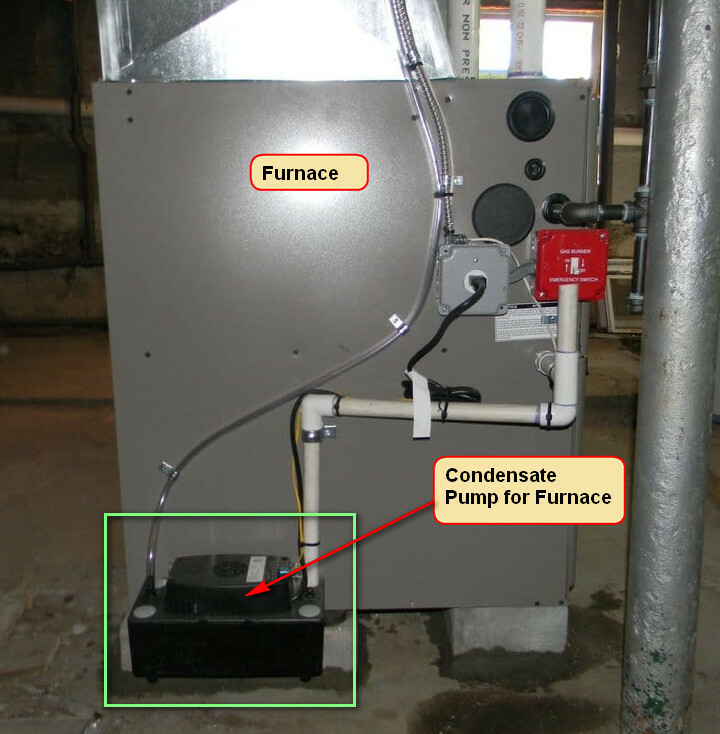 When the furnace works, it creates moisture and it goes into this condensate pump and then there is a little pipe that pumps it out when it fills with water. I had them stick their finger in the condensate pump and see if the little hole was near the top. It is. I told them to get a glass of water and pour it in until the water reaches the top. There is a float in there that is supposed to go on and pump the water out once it fills. Well, it didn't pump the water out. 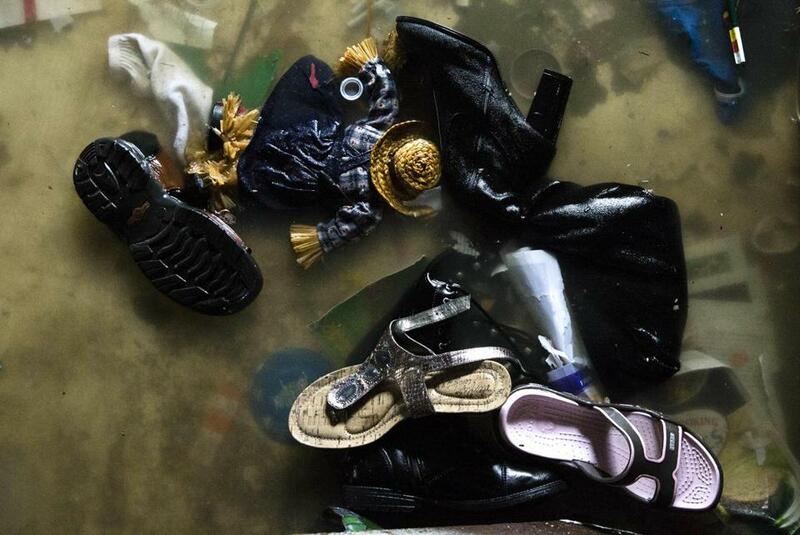 What was happening was the water from that condensate pump was leaking out onto the floor. Because it was raining outside, they thought there was a leak. 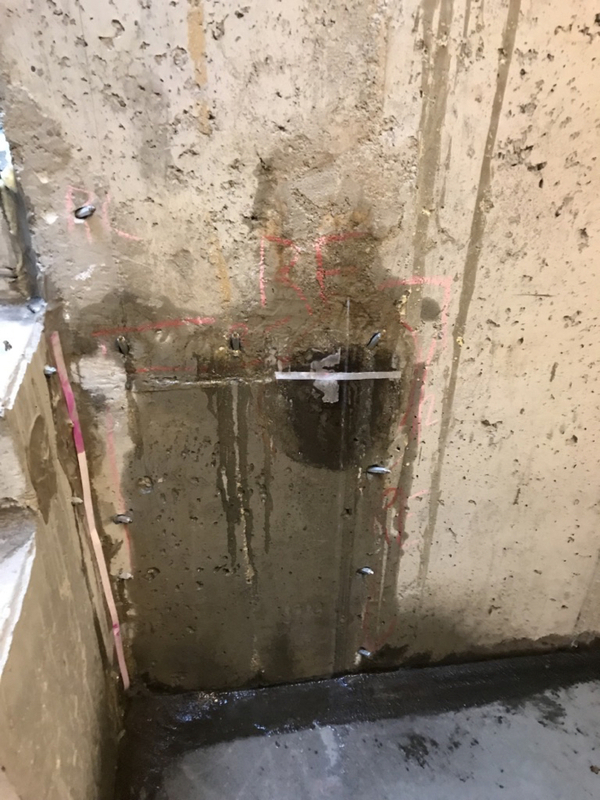 We diagnosed all of this over the phone because we want to be sure it is something we can help customers with and we are happy to help homeowners with their basement water problems. I had a Worcester firefighter call us up. He lives in Hudson, MA and he had water coming into his finished basement. He couldn't figure out how it was coming in. We told him to go outside and take a look at the wall where it seemed to be coming in from. As you know there can be anywhere from 3" of concrete to feet of concrete showing. He went outside and sure enough he saw a hairline crack. We told him to go inside and open up that area in the Sheetrock where the crack was. He opened it up, and sure enough, there was water coming in from that little crack. He was amazed that so much water could come in through a crack that small. He was also amazed that we diagnosed his problem over the phone. We went out and fixed the crack in the foundation and gave him a full-warranty. As a result, we have fixed a few more basement and foundation problems for some other Worcester Firemen. The leakage is coming in through a hole to the right of the stairs at the back wall of the garage. We believe the areas adjacent to the hole are wet from the single leakage source. Below is the photo and video of the leakage observed last week.